I LOVE easy dinners, I LOVE tasty dinners, and I LOVE my crock pot! We love this salsa chicken in my home! This is what we had for dinner tonight! You will LOVE this chicken! It has an amazing flavor and is SO easy! The other great thing about this chicken, is it is so versatile in how you can use it! We like to use it in tacos but you can make burritos, salads, enchiladas, over rice, or however else you would like. Add chicken to slow cooker. Sprinkle taco seasoning on the chicken. Mix salsa and cream of chicken in a seperate bowl and add to crock-pot over the chicken. Cook on low for 6 hours until chicken is done. 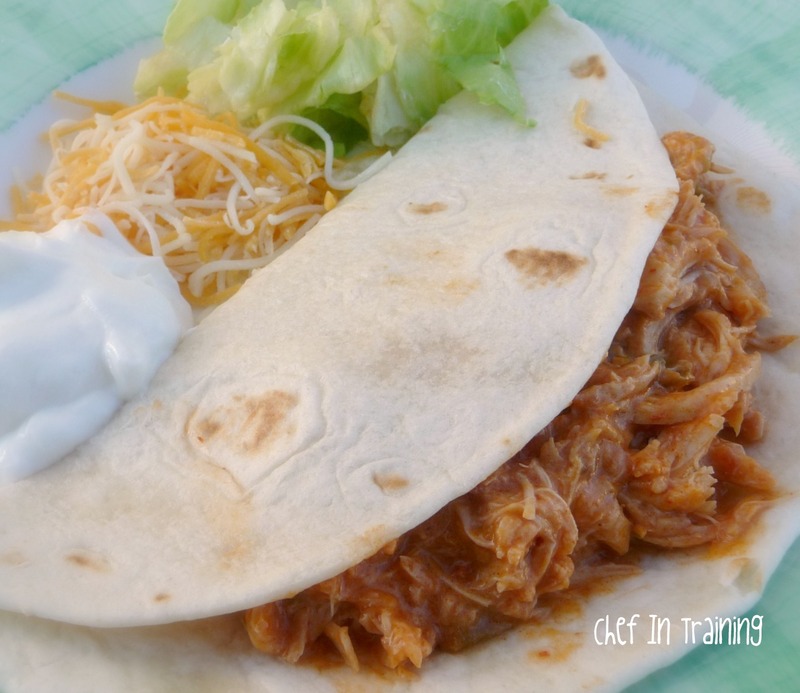 Shred the chicken and serve in a wrap or over rice. Did you use frozen or thawed chicken?You should check out my Salsa Chicken at thestokerkitchen.blogspot.com. It was posted on August 13th. Let me know what you think. This sounds delicious! I've done chicken and salsa before, sometimes adding a can of corn and/or black beans. I love the idea of the taco seasoning and soup. Thanks!! I have now looked over all your yummy recipes from the link party at Sew Can Do. I am now a follower! This sounds very easy and yummy. I came from the Tip Junkie Link-up. That sounds so yummy! I love that it is so easy too!! Thanks for the recipe. I just made this for dinner tonight. was going to surprise the wife when she got home from work. but she ended up having to babysit a friends little girl til 9 or 10pm. So I had a great dinner by myself. made some re fried beans and some Mexican rice and guacamole. . Great recipe a definite keeper. thanks and a stumble upon thumps up to.